The purpose of my lunch visit to Donatella, the newest restaurant from Donatella Arpaia, was to meet their young pasty chef, Andrea Jarosh and try some of her desserts. Unfortunately, I was immediately diverted from my goal after we started eating some savory dishes. Usually, when I know I’m going to be consuming 4+ desserts in a sitting, I try to limit the amount of savory dishes I order. However, on this day I was accompanied by the prolific NYC food critic,Yvo (The Feisty Foodie) and didn’t want to deprive her of sampling the full spectrum of savory dishes. I had a situation on my hands–that is I was starting to feel full and I have been doing this long enough to know you can’t head into a multi-dessert tasting with a full stomach. The solution ended up being simple: drag out the lunch for hours while enjoying plenty of appetizers, mains and desserts. Ok, maybe that wasn’t much of a situation. Before I get into the desserts I just have to mention two savory dishes which were absolutely superb. A few months ago Nick Solares from Serious Eats NY noted that the Capellacio pizza was “absolutely extraordinary” so on his recommendation we went for that and I 100% agree with that assessment. It was easily the best pizza I had in 201o. Why? 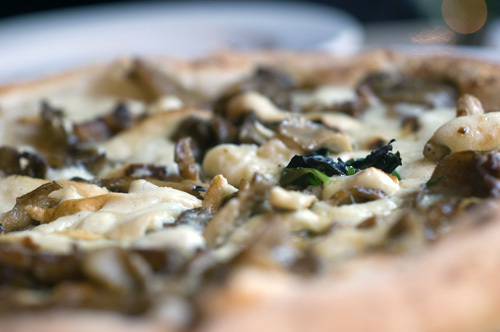 The smoky buffalo mozzarella, the delicious marinated mushrooms and the perfect crust. Another exceptional savory dish was their Parmigiana Di Melanzane (Eggplant, mozzarella, tomato and basil) served in a tiny cast iron pot. For more savory coverage check out The Feisty Foodie. There’s also a cool story about Donatella’s oven here. Pastry Chef Andrea Jarosh is a true native New Yorker, born and raised in Queens and at 25 already has an impressive resume. Before coming to Donatella, Andrea worked in the kitchens of One if By Land, Two if By Sea and Union Square Cafe where she was on the team with chef Jarret Appell. When Appell joined Donatella she was delighted to be recruited. More impressive than her resume is her passion for her craft. Every one of her desserts has a story which Jarosh will excitedly tell you and every dish has a specific reason for being on the menu. Before visiting Donatella, I had only tried sfogliatella once. This dessert is made with soft, flaky dough and stuffed with a traditional filling of ricotta, seminola, sugar, cinnamon, eggs and candied citrus. Some have said that there are no good bakery sfogliatella in New York. At Donatella, every sfogliatella is made to order and the dough is crisp, flaky and delicious. Each pastry contains 50 feet of dough (!) that has been stretched paper thin before baking. 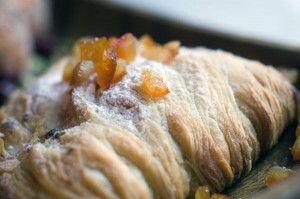 The filling is then carefully added to the fragile pastry. The filling is a heavenly mix of flavors led by orange blossom which goes well with the not-too-sweet ricotta. To my knowledge, this is the only place in New York where you can get made-to-order sfogliatella, so get one if you go. In Italian Torta Pazzo means “crazy cake”, named for the frantic state of the chef when she was creating it. And if you are a true, card carrying chocoholic you must order this since it contains no less than four types of chocolate. The base of white chocolate feuillitine crunch is made with Sicilian pistachio paste, white chocolate and crispy feuilletine. 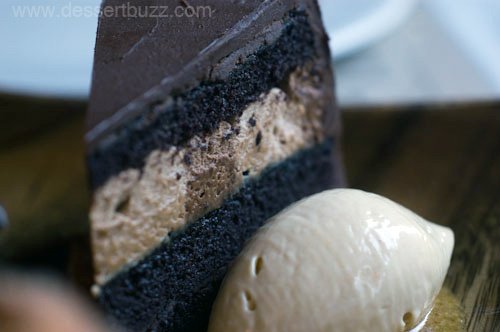 The next layer is a bittersweet ganache and then four layers of Devil’s Food cake made with Valhrona Dutch process cocoa powder. Between each layer is a tiny bit of cherry jam and a two different mousses, one milk chocolate and the other bittersweet. It’s served with Hazelnut gelato. The devil’s food was very light as you would expect but overall what I like best about the cake is that it wasn’t too sweet. It was all about the chocolate and not about the sugar. 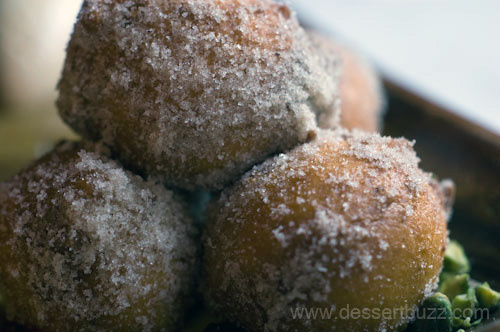 When I think of zeppolis I am brought back to my grade school years in NYC where trucks in the San Gennaro festival would sell these deep fried balls of dough still dripping with hot oil and coated with powdered sugar. Luckily, Donatella’s zeppolis are nothing like those. 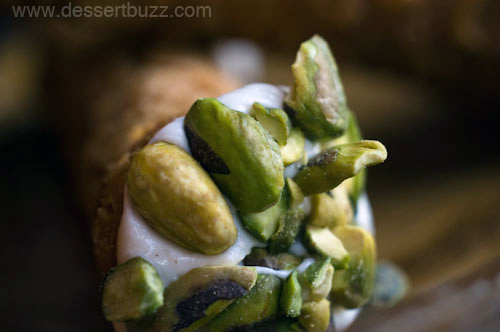 In fact, they were actually kind of light and were served with lemon cream, sour cherries and pistachios so you can regulate the sweetness and whether or not you want a “filling” to go with them. 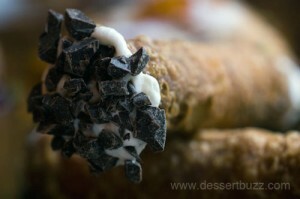 I’m not usually a fan of cannoli because often I find they are too sweet for my tastes. Not these. I ate about 9/10 of both pieces that came to our table. I’ll have to ask Yvo if she recalls getting a chance to try them. My recommendation here is that if you like cannoli or have at one time in your life, liked cannoli, do yourself a favor and order these. 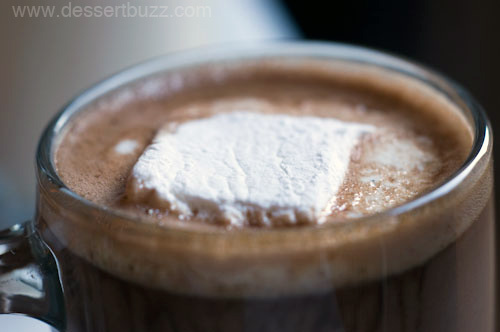 Other notable winter items include Valrhona bittersweet hot chocolate with a tablespoon or two of Nutella. It’s served with a house-made marshmallow. 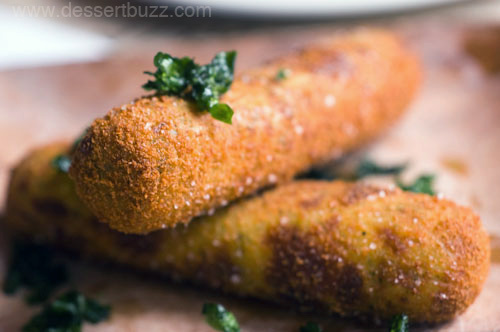 You pretty much can’t go wrong with those ingredients. 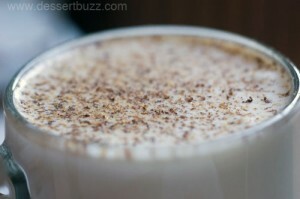 Donatella’s coconut eggnogg is as unusual as it is delicious. Imagine an egg nog made from the foamed steamed milk (the kind that comes on top of an expresso) infused with some sweet coconut cream, rum (also sweet) and Bourbon. This is a cold drink that will warm you in the winter. Good stuff. Look for an interview with Pastry Chef Andrea Jarosh coming soon. Donatella is located at 184 8th Ave (19 St) Their web site is here. Awesome pics and write-up! Love! Also, I definitely had the cannoli – my first ever – and was really surprised because the shells always look so thick and hard, but this one was airy, light, crisp… mmm. one. They provide dedicated home moving services to help individuals move easily and smoothly. “When your ‘Sixth Sense’ is going to be activated, you’ll find following ideas and tricks in your mind:Research work: You will start conducting a research to discover best moving agency inside your city. that you simply imparted this accommodating data to us. If it’s not too much trouble keep us educated this way. Greetings i am Ravinder, its my first time to remarking wherever, when i read this bit of composing i thought i could likewise make remark because of this sensible post. I eat many time Pizza. Thanks for share your valuable post.